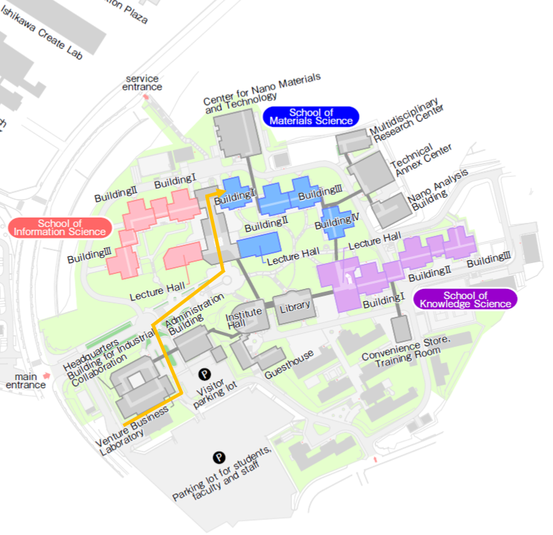 For access to our university, please see JAIST traffic access. Get off at the bus stop and go through the road between the buildings, head towards the Rotary direction, head towards the fountain while go up a gentle staircase, there is an entrance written as "Material Science" on the left side of the fountain. Enter the entrance, go up the stairs in front of you, turn right at the end of the street and you will find the elevator on your right. Please get on it and go up to the 6th floor. is the living room of Professor Oshima.